SAN DIEGO--(BUSINESS WIRE)--Feb. 2, 2017-- Jack in the Box® is taking its award-winning Buttery Jack line to new, bacon-filled heights with its latest signature burger, the NEW Triple Bacon Buttery Jack™. 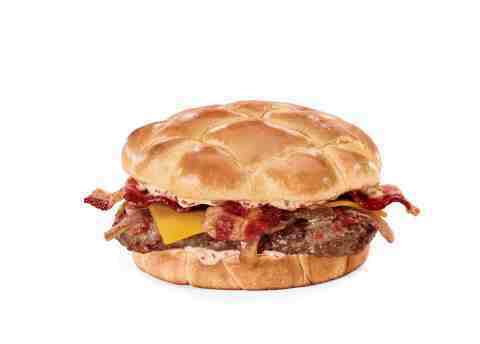 A burger unlike any other, the Triple Bacon Buttery Jack boasts a first-of-its-kind secret ingredient, real bacon butter! Jack has revolutionized the way we eat bacon with the NEW Triple Bacon Buttery Jack. Jack marries the slices of hickory-smoked bacon with savory, melted bacon butter. Rounding out the trifecta, the burger is then topped with a delicious bacon mayo. The Triple Bacon Buttery Jack features a quarter-pound beef patty, grilled onions and cheddar cheese, all on a gourmet signature bun. It’s got the craveable flavor of bacon in every bite! Jack in the Box Inc. (NASDAQ: JACK), based in San Diego, is a restaurant company that operates and franchises Jack in the Box® restaurants, one of the nation’s largest hamburger chains, with more than 2,200 restaurants in 21 states and Guam. Additionally, through a wholly owned subsidiary, the company operates and franchises Qdoba®, a leader in fast-casual dining, with approximately 700 restaurants in 47 states, the District of Columbia and Canada. For more information on Jack in the Box and Qdoba, including franchising opportunities, visit www.jackinthebox.com or www.qdoba.com.